Inspired by the music and culture they encountered during their tour through the land of the Rising Sun, Dave Brubeck and his quartet hurried back to the studio to pen a set of tunes commemorating the experience. 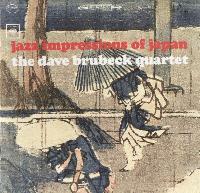 Although somewhat overlooked nowadays, the resulting, Jazz Impressions of Japan, is a noteworthy entry in the quartet's laudable catalog and an excellent mainstream jazz record in its own right. The Japanese influences may be superficial and the rhythmic patterns may be noticeably simple compared to past offerings, but the music presented here still boasts perusable depth. In their sincere pursuit of approaching jazz from a different angle, the quartet gives a remarkably thoughtful and diverse performance, rounded out by their distinctively spirited key and alto sax flourishes and instrumental interplay. Impressions is full-blooded American, but nonetheless praiseworthy. One of the most underrated Brubeck albums. Beautiful.